Last year we first heard Blimp Rock’s ode to warmth, and this year it gets the video treatment. Peter Demakos spends most of it in his bedroom, strutting around in or with long johns. It’s the perfectly weird Christmas video you didn’t know you needed, followed by an ending that will even make Canadians flinch. Here’s a treat from Coeur de Pirate (Béatrice Martin) for those of us who find the holidays depressing and are on the look out for downer Christmas music. Chansons tristes pour Noël is a three song EP filled with seasonal melancholia including a cover of Wham!’s “Last Christmas.” Martin’s downcast version sounds much more in line with its woeful lyrics than the 80s pop sounds of the original. Bonus good cheer! All proceeds of the EP go to Le Phare Enfants et Familles. Taking her cues from Mariah Carey, all Emma-Lee wants for Christmas is for her special someone to be around. In “It Won’t Be Christmas,” an original, very poppy, Christmas track, Emma-Lee cleverly uses lyrics from other Christmas songs to express her sadness -“I can’t rock around the tree unless you rock around with me”; “Silent night, oh holy night, so lonely”. The resulting song is super fun and probably one that you will hear on the tv or in line at a store somewhere. With its lo-fi folk sound, Forest Creatures’ And Lo… has a Sufjan Stevens’ Songs for Christmas vibe (his Christmas album before he declared that he was a “Christmas Unicorn”) to it, mixing traditional, popular, and original Christmas songs. “It’s Beginning to Look A Lot Like Christmas” gets a fittingly playful treatment and in “The Friendly Beasts,” Forest Creatures and friends all gather together (each animal is even personified by a different person; the cow is hilarious) for a friendly romp. Standout original song “Paper Jesus Dioramas” captures all the small but wonderful things (“socks and sweaters, new pyjamas”) that can make Christmas so nice. Yay, Hannah Georgas covering the extraordinarily groovy Donny Hathaway song ‘This Christmas”! Appearing on Amazon’s All is Bright compilation, Georgas’ version is horn-filled and smooooth and will get you grooving into the holiday spirit. Click here to buy. Ladyhawke is also on this compilation, performing “Merry Xmas Everyone“. Can it really be? Yes! The Line of Best Fit continues its excellent musical tradition, with 18 new songs by Canadian artists, this time featuring the likes of Doomsquad, Heaven For Real, Hannah Epperson, Phern, the Hidden Cameras, Lab Coast and tons more. It also features the first recording from nêhiyawak and a bonus track from Owen Meany’s Batting Stance. 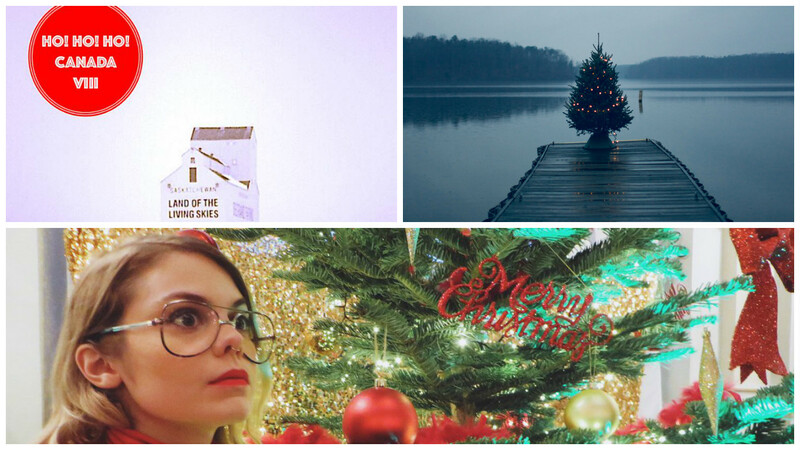 Your alternative Christmas playlist just got even more massive. Free to download! We just missed this song last year, so this 2015 song is getting a spotlight now. Somehow combining hip-hop synths and delivery with a banjo backing, the song manages to be both a Christmas song and a look at how terrible our times have become. The song mentions climate change and rain, and it’s worth a reminder that there might not be a white Christmas in the next few decades. But if you need shelter from the cold, Jesse Dangerously is your guy. The timeless folk sounds of Kacy & Clayton can now grace your holiday music playlist thanks to their contribution to Amazon’s Acoustic Christmas. The duo take on the traditional English carol “How Far Is It to Bethlehem?” (renamed to “Is It Far To Bethlehem”) and make it into a rambling folk tune guided by the bright voice of Kacy Anderson and Clayton Linthicum’s deftly plucked guitar. Click here to listen to the track in full and here to purchase the song. Also featured on Amazon’s Acoustic Christmas is Montreal’s Little Scream singing an original ditty, “Lou and Jessy’s Christmas“. If you love A Charlie Brown Christmas and its soundtrack, you will get a kick out of Good Grief: A Christmas Tale. Mysterious Toronto beat maker Lakeshore samples the original soundtrack and some of the dialogue from the tv special to make two really groovy sounding songs. For the forth year in a row, Milk & Bone have gifted us with a cover a holiday song. This year, it’s an extra synth-y cover of the aforementioned Wham! Christmas song, which you know is one of your favourites despite the layers of cheese. Here, the added synths give it a spacey feel, and the vocals keep everything merry and bright, almost eliminating the melodrama of the original. In fewer than 120 seconds, the Pack A.D. unleash a ferocious barrage of Christmas-themed rock, complete with jingle bells behind the grungy guitars. They encourage you to sit and drink egg nog in a coconut, because why not? Here’s a quiet, lo-fi folk EP from Toronto’s POESY that’s perfect for a snowy night in or for those planning on hiding in bed all holiday season. A Cozy POESY Christmas includes the traditional song “Auld Lang Syne” and three really nice original songs – “An Artist’s Christmas Carol”, “December 26th,” and “Stained Glass Certainties” – that all find POESY demonstrating that there is more to Christmas than just exchanging gifts. Quiet Parade have always excelled at putting out gentle, emotional songs, and Christmas Through the Fog is an EP that both follows that mandate and twists it around. Their cover of “Christmas (Baby Please Come Home)” is soft-spoken, but “O Come O Come Emmanuel” is loud and proud—right down to the electric guitar solo. Originals “The Christmas Song” (featuring our old pals Dance Movie) and “Heavy Winter” are heavier as well, showing that the band’s quietness does not mean they are meek. Hamilton’s Scarlett & Disher never fail to deliver on seasonal songs, usually gracing us with a new collection of Halloween and Christmas songs. As usual, they add some wonderfully weird twists to some classics, like their glitchy take on “Hark! The Herald Angels Sing!” or an unexpected kazoo intro to “Up on the Housetop.” The classic “Jolly Old St. Nicholas” gets a poppy treatment and “It Came Upon a Midnight Clear” gets a gloomy, heavy backing. Finally, they have an original song, “This Year’s End,” a synth-buoyed number that will get you moving as you contemplate the shittiness of the year, while keeping in mind that some things will never change for the worse, no matter how much time passes. There’s a comfort in this classic Christmas song, and Terra Lightfoot makes it feel warmer than ever with this beautiful, fingerpicked cover. There’s no over singing, just the quiet beauty of Lightfoot’s strong vocals and the simple acoustic guitar. Gordon Lightfoot’s “Song for a Winter’s Night” is one of the best songs to capture the pain of pining for someone during a Canadian winter. The version of Lightfoot’s song from husband and wife duo Winsome Kind is wistful but not as mournful as some other versions. It’s like they know that everything will work out in the end.